This merienda treat is called by many names: tinutong (which refers to the process of burning the mung beans), guinataang munggo, lelot balatong. I think the last term is Ilokano in origin, and is the one I'm familiar with. The nearby Jollijeep in our office sometimes sells this for merienda, and when I order lelot, they give me a puzzled stare. So I point out what I want instead. This is also one of the goodies my sister cooked for us when we were kids. We'd help her out in crushing the mung beans. The aroma of the mung beans would permeate the air and we'd know we're going to have a nice merienda break! On a pan under medium heat, place mung beans and stir occasionally. 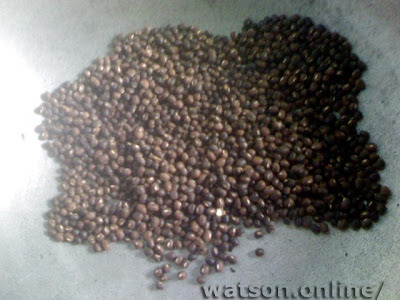 The mung beans should become dark brown but not black. Remove from fire. Place the burnt mung beans on a bilao and crush using a rolling pin or bottle. Unfortunately for us, we all forgot we had a bilao (it was just sitting nearby, loaded with tomatoes from our small garden) so we used a large plate instead and a bottle. Crushing the mung beans will remove the outer shell and crush the seeds. 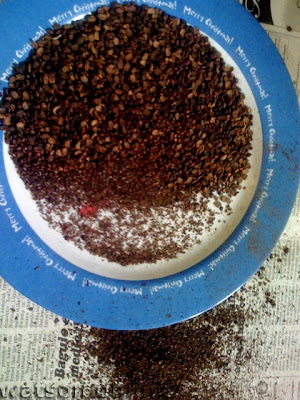 Do you know how to use the bilao in removing small stones and excess husk from rice? That skill will come handy here. 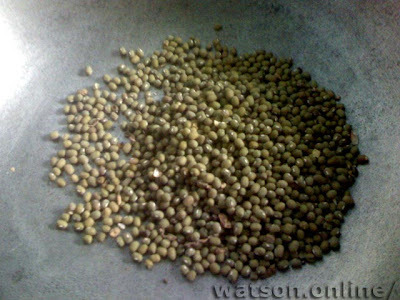 Toss the mung beans into the air to separate the shell from the crushed seeds. Discard the shells into your garden. Cook the malagkit with extra water in it. 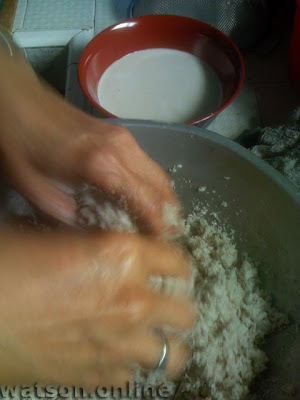 When the water boils, remove some of the water and use to extract the milk from the grated coconut. Set aside this first milk press. 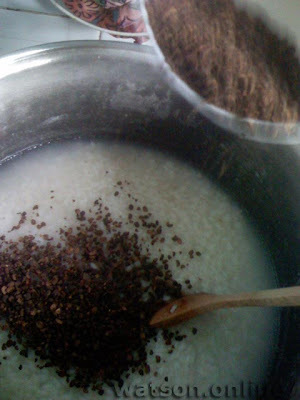 Then use hot water to extract the rest of the coconut milk into another container. 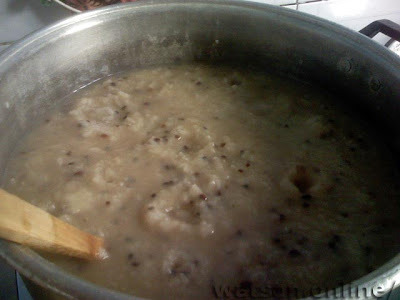 Place the mung beans into the malagkit and mix continously. Beware, the malagkit will look like the surface of a volcano, with hot air rising forth and popping off hot water and rice. I learned this the hard way. Ouch. 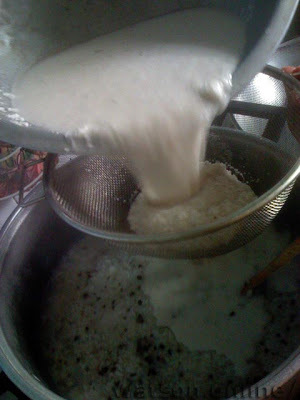 After a couple of minutes, pour the second-extraction coconut milk into the half-cooked malagkit and continue mixing. Add brown sugar to taste and continue mixing. We used 80% of the 1/2 kilo brown sugar. 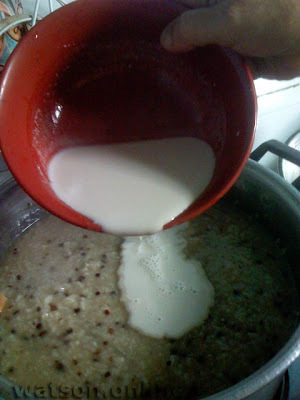 When the malagkit is cooked, pour in the first extraction of coconut milk and mix. Let cool before serving. Jo-Lo's cousins were around to sample the merienda. Whoa, it's their first time to have this! They loved it! my wife and i just love ginataang mungo! nice post! arpeelazaro: And you have a nice blog! Thanks for dropping by! oh my, I can just imagine the aroma with the fresh squeezed coconut milk. I think I miss that the most when cooking ginataan here and use the canned coconut milk. Parang kulang sa aroma. That looks hard to make. Must take a long time. Sounds yummy though. I wish I had the patience for it. 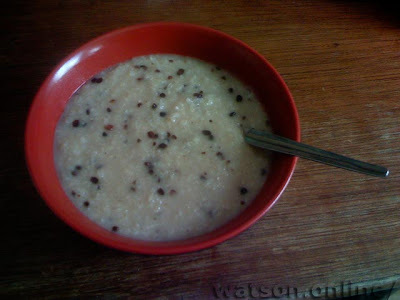 yes, it is indeed called lelot balatong in ilokano. nagluluto ng ganyan si mommy nung bata pa ako. that looks so good! i particularly love having a bowl of lelot balatong on a cold rainy afternoon. thanks for sharing. atleast naalala ko tong dish na to. magpapaluto ako kay ma kasi matagal na din akong di nakakatikim ng ganito. JMom: thank goodness there's abundance of coconuts in Baguio! 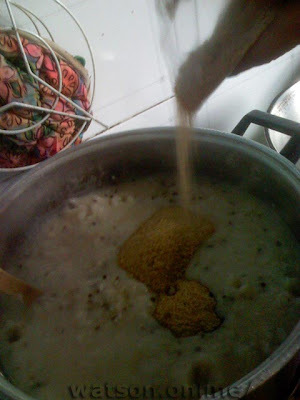 Foodaholic: Yeah, you do need time and effort to make it, or else the glutinous rice will burn. But the aroma itself and the taste is well worth it. Ryan: comfort food ito, ika nga. yan pala tawag dyan! my lolo used to make ginataang monggo before, sarap... ang bango pa! 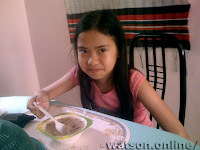 i love guinataang halo-halo and bilo-bilo also! some would call this lelang balatong or lelong balatong. be it as it may, i love it soooooooo much!